Jan Six, art historian and art dealer, made headlines yesterday. He discovered and bought a ‘new’ Rembrandt. This previously unknown Rembrandt is exhibited at the Amsterdam Hermitage from today, for just four weeks. Yesterday, Six gave exclusive interviews to the Dutch NRC paper and on Dutch television. Today, a media storm broke, with media all over the world reporting the discovery. On television, Jan Six revealed part of the detective story behind his discovery. While leafing through a Christie’s catalog for an upcoming auction, a photo caught his eye. When he read the description, things jarred. He called Dutch Rembrandt expert, Professor van de Wetering. The latter is the former chair of the Rembrandt Research Project. Minutes after the call, Six met the professor at his home and showed the photo. After studying the photo, the professor advised a quick look at the real thing. So Six hopped on a plane to London, to have a look at the painting at Christie’s. Shock: photo and painting did not match – the painting had been cleaned. Jan Six managed to take a few photos; then dashed to London’s National Gallery. This museum has several Rembrandts of the same period. It enabled Six to compare paintings, think and draw preliminary conclusions. But in order to buy the painting at the upcoming auction, some serious money was needed. Fortunately, Six found a backer. They managed to buy the painting. Once in Amsterdam, research started. There are the Amsterdam archives. The latest techniques were used. Think of what visitors were able to watch at the Mauritshuis, during its ‘Girl in the Spotlight’ project, earlier this year. The collar which caught Six’ eye, was only fashionable for a very short period among wealthy Amsterdam young men. Rembrandt’s technique for painting such collars greatly differed from other painters and was used in this painting. The right-hand corner looks odd? X-ray and other techniques revealed this painting had been cut several times. Rembrandt was not responsible for this. In his forthcoming book, Six makes a case for a wedding portrait of a couple, painted by Rembrandt, of which the woman ‘disappeared’. 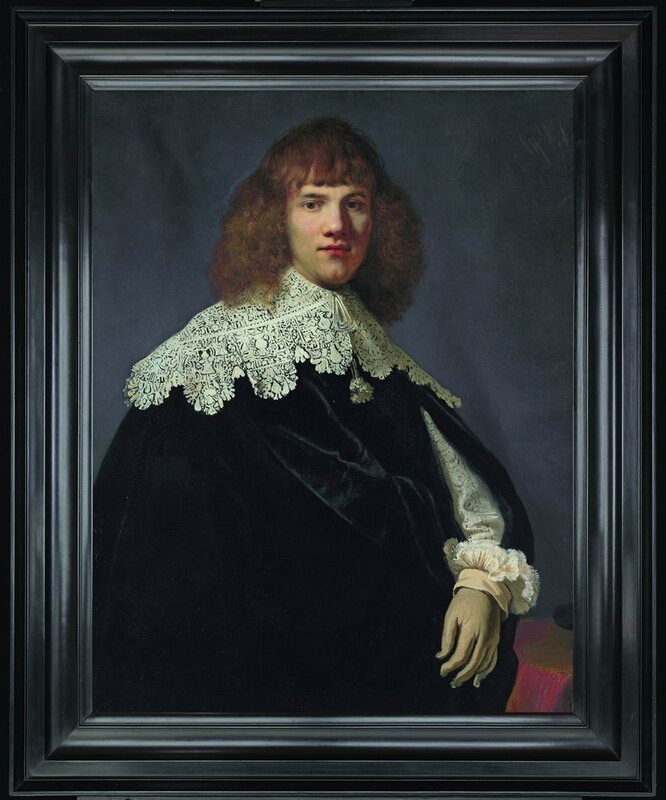 Why this ‘Portrait of a Young Gentleman’ was cut to a smaller size remains unclear. Six thinks the painting may have been damaged. On the other hand, it was not uncommon for paintings to be cut, reduced or enlarged. A former director of Christie’s Amsterdam mentioned important discoveries remain possible at auctions. However, he did admit the auction house’s reputation will suffer. If this painting had been listed as by Rembrandt, instead of ‘Circle of Rembrandt’, it would have fetched far more money.